I learned the Star Spangled Banner in grammar school right along with the Pledge of Allegiance. Our music lessons at McKenzie included folk music, rounds, spirituals, patriotic music and national anthems from ours as well as several other countries. I loved all of it, but especially the service songs — Army, Navy, Air Force and Marines. Chorales or Choruses from various branches of the service came to Florence in the 1950’s and the whole town turned out. The most popular movies were war stories from WWII, whether they were love stories, musicals, or dramas. When television arrived at our house, Victory at Sea became a favorite show. These days a lot of businesses will remain open and feature big sales on Memorial Day, Independence Day, or Veterans Day – holidays designed to remember and honor the sacrifices of our armed forces and their families. Some folks may take the day off and take advantage of those sales. Or they might picnic at the park or barbecue in the back yard, enjoying a long weekend off from work. In researching my daddy’s family tree, I discovered that in the late 1700’s Stephen Motte was granted a “patent” for land in the North Carolina coastal area for service in the Revolutionary War. He traded that land for a parcel in what became known as Mott’s Township, the territory around Olanta, South Carolina. 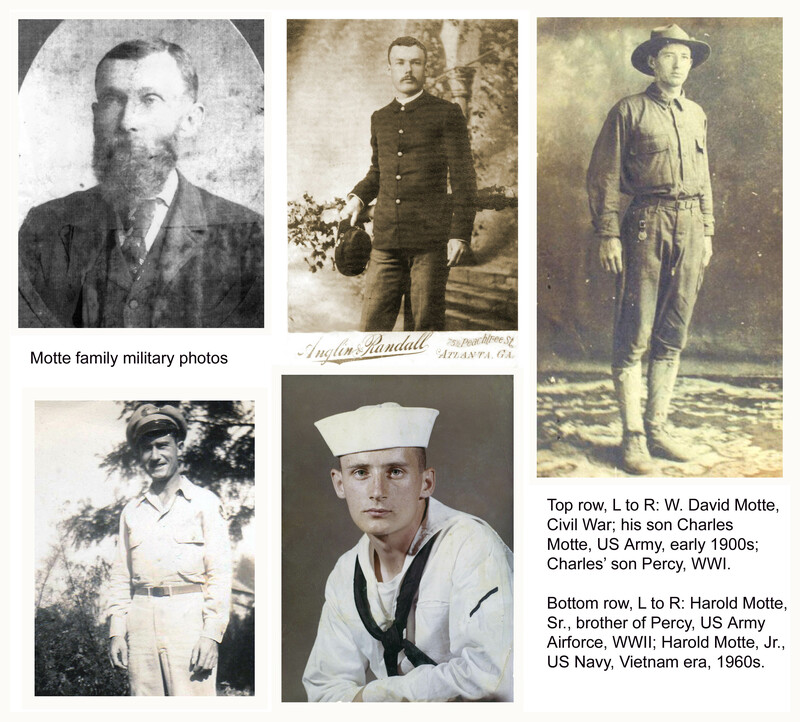 My great-great-grandfather John Motte served with Captain Zimmerman’s Pee Dee Artillery. Wounded in May of 1864, he spent time recovering in the Confederacy’s Chimborazo Hospital in Richmond. His son David Motte, too young to be regular Army, became a teenage prison guard attached to the Confederate Army. Grandfather Charles H. Motte (see photo) joined the Army after the Civil War, stationed in New Orleans where he met and married my grandmother Etta Follette. Some of Etta’s relatives had been Union soldiers during the Civil War, one fighting in several of the same battles in Virginia as John Motte. Charles and Etta’s first son Percy served in the US Army in WWI. My father Harold Motte, Sr. enlisted in the Army Air Force in 1941, served several years and re-enlisted. He became a glider pilot and an aircraft mechanic. 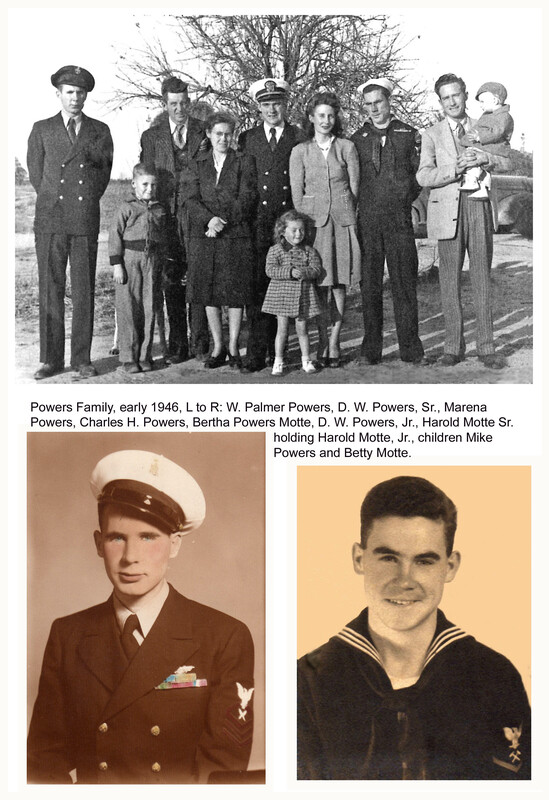 Several of my mother’s brothers joined the Navy during WWII, Palmer becoming a career submariner. My brother Harold served in the Navy in the 1960’s, stationed on an ammunition ship in the Mediterranean Sea during the Six Days War. Maybe it’s not politically correct nowadays, but every time I hear From the Halls of Montezuma or Anchors Away, my heart still flutters a bit and I recall my family’s centuries-long heritage of military service. This entry was posted in 1940s, Childhood memories and tagged Army Airforce, Indepedence Day, Memorial Day, US Army, US Navy, Veterans Day. Bookmark the permalink. Reblogged this on Talk With Bette.